How do you type a true minus sign (not a hyphen) on a Mac? I'm looking for one of those ⌥+? shortcuts to type a minus sign (−) from the keyboard, without touching the mouse. I'm looking for the minus sign (−). It should have the same width as a plus sign (+), and its Unicode code point is 8722 (x2212 in hexadecimal). The hyphen minus (-), already on the keyboard, is not the typographically correct symbol for subtraction. The em dash (—, ⇧+⌥+-) is used to signify a break in thought and is far too wide to be confused for a minus sign. The en dash (–, ⌥+-) is used for ranges of values or relationships and connections and shouldn't be used in place of a minus sign. Here's a really fast way to insert a minus sign (or any other sign for that matter). 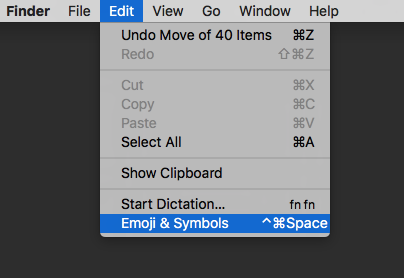 You will then be presented with the Emoji & Symbols search box; just type "minus" and you will be presented with all the options for "minus signs"
There's a way of entering Unicode values on the Mac: go to System Preferences, then Language & Text. 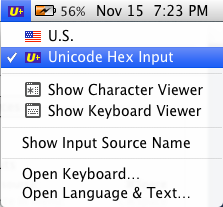 In the Input Sources tab, scroll to Unicode Hex Input, check it. Go to Edit > Special Characters...; in there, select the Unicode tab, and Code tables (or however it's called in English) at the top. If you need to do this a lot, you might get ukelele and use it to create your own keyboard layout. That's what I did, and now I can type all kinds of mathematical symbols with ease, such as lots of integral signs (∫, ∬, ∭, ∮), ∅, ∇, ∀, ∃, ∑, ∏, ⊂, ⊆, ⊃, ⊇, not to mention arrows: →, ←, ↔, ↓, ↑ and so on. (However, you probably don't want my keyboard layout, as it is based on the Norwegian keyboard.) I admit it took me a while to put it together, but I feel it was worth the effort. Your mileage may vary, however. I found a new, better solution, but it's also not free. 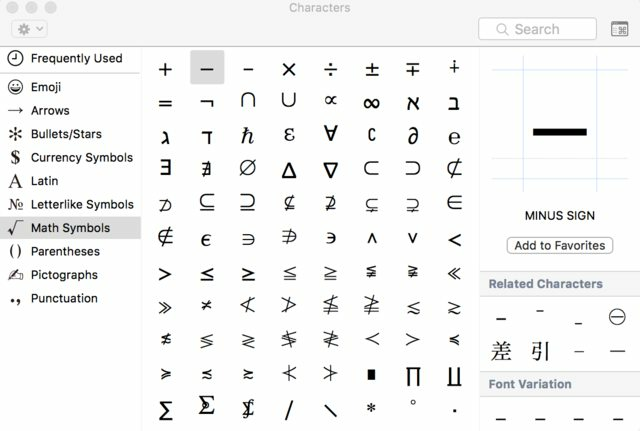 You can use the popular Mac productivity utility Alfred with a workflow extension to search for and copy any unicode character. 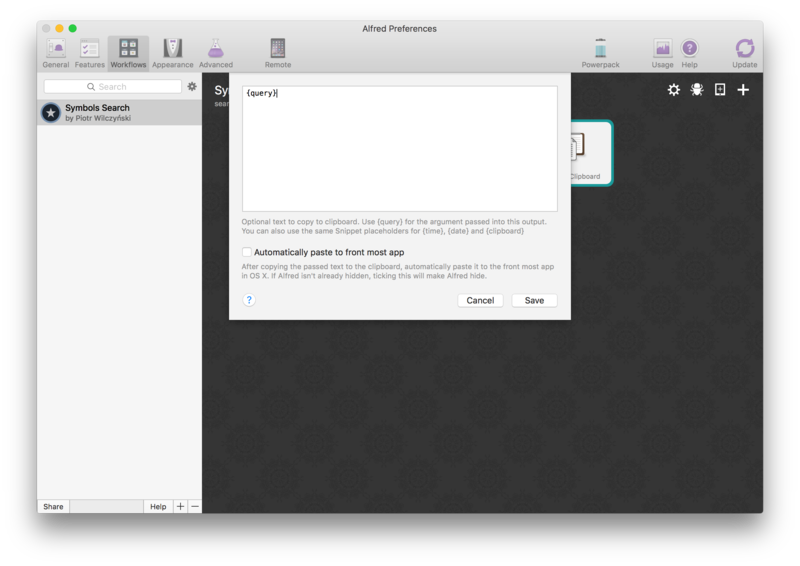 First, install Alfred from alfredapp.com. Then go to the unicode-symbols-search repo on Github and download the ZIP. 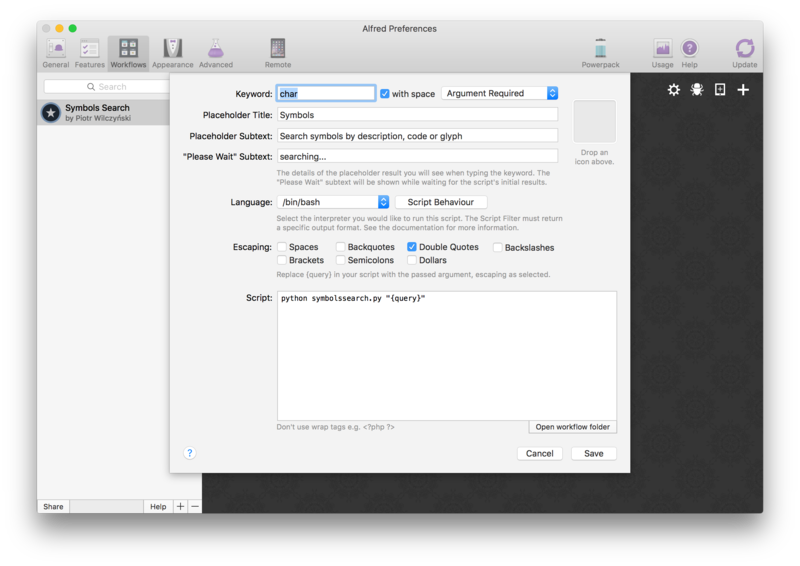 Open the ZIP and the contained folder to find a file named Symbols Search.alfredworkflow. Open that file and Alfred should take over and install it. I make two customizations: I change the keyword for this workflow and I turn off automatic pasting. The default keyword is uss, which means nothing to me. I change it to char. 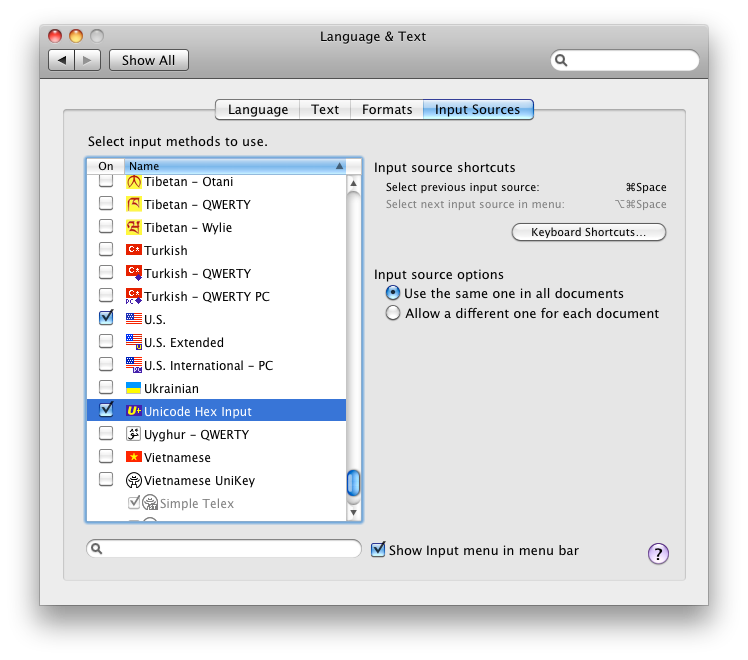 First, press the keyboard shortcut to show the Alfred prompt and then press Cmd , to open preferences. Navigate to the Workflows section and you should see Symbols Search. Double-click the left box labeled Script Filter to open its configuration. Change the keyword to char (or whatever else you want). As above, go to Alfred Preferences > Workflows > Symbols Search. Double-click the right box labeled Copy to Clipboard to open its configuration. Uncheck the checkbox labeled Automatically paste to from most app. Now let's actually use it! Press the down arrow until minus sign is highlighted. Press Enter to copy to the clipboard. Go back to whatever app you want to paste the minus sign into and do it. The first time you do this isn't fast. Every other time is. It's not free, and you have to use the mouse briefly, but the fastest way to do this is with an app named Characters from the Mac App Store for $2.99. 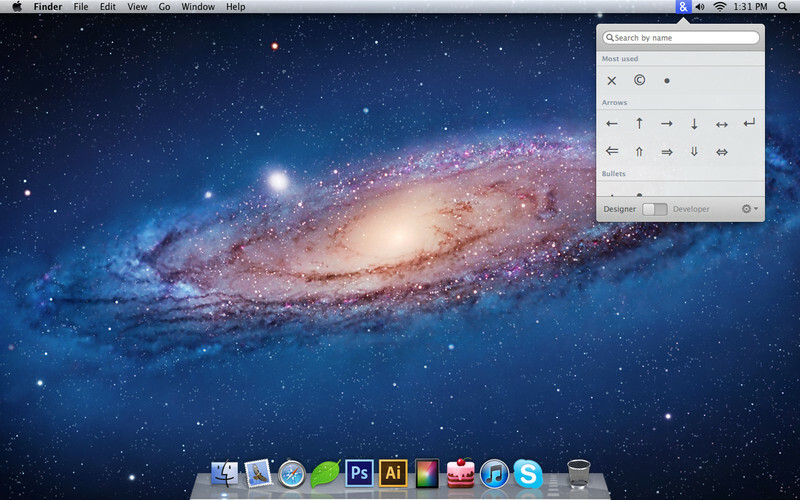 You click the icon in the Mac menu bar, search for a character, and use the arrows and Enter to copy it to the clipboard. Click Insert --> Symbol --> Advanced Symbol. That will open the Symbol browser. In the lower left side, click the "Autocorrect" button, which will open the autocorrect window. Under "Math Autocorrect" tab, activate "Use Math AutoCorrect rules outside of math regions"
In the "With" box, enter the "minus" symbol. I had to "cut-and-paste" it from a text document. Done. Next time you type - it will be replaced by the minus sign. You can set up just a regular autocorrect shortcut for this as well, which I found much simpler. First, insert a proper minus sign into a Word document somewhere using the "Insert symbol" function. Highlight that minus sign. Go to "Tools" --> "Autocorrect". The proper minus sign you have highlighted will show up in the "replace with" field on the right; all you have to do now is type whatever shortcut you want to use on the left. I like to use letter combinations that won't show up in other contexts, but are somehow reminiscent of what I actually want to type; I chose "mnsgn" in this case. Click "add" and then "OK". 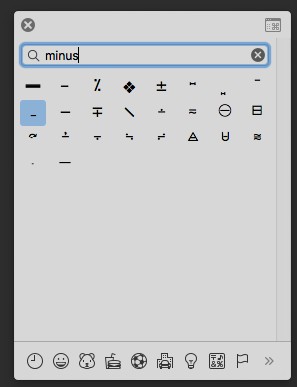 Now, whenever you type whatever your shortcut is, it will be autocorrected to a minus sign. 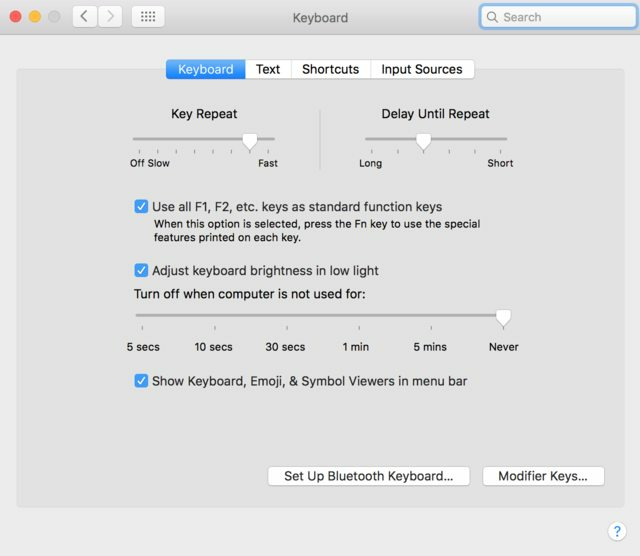 Go to System Preferences --> Keyboard and (make sure you are on tab 'keyboard') check mark option of "Show Keyboard, Emoji, and Symbol viewers in menu bar" this will put an icon on your mac menu bar right side. Click on that icon, will open a menu. Choose "Show Emoji & Symbols". It will open a dialog box. Choose "Math Symbols". You can insert the minus sign from here as shown below. 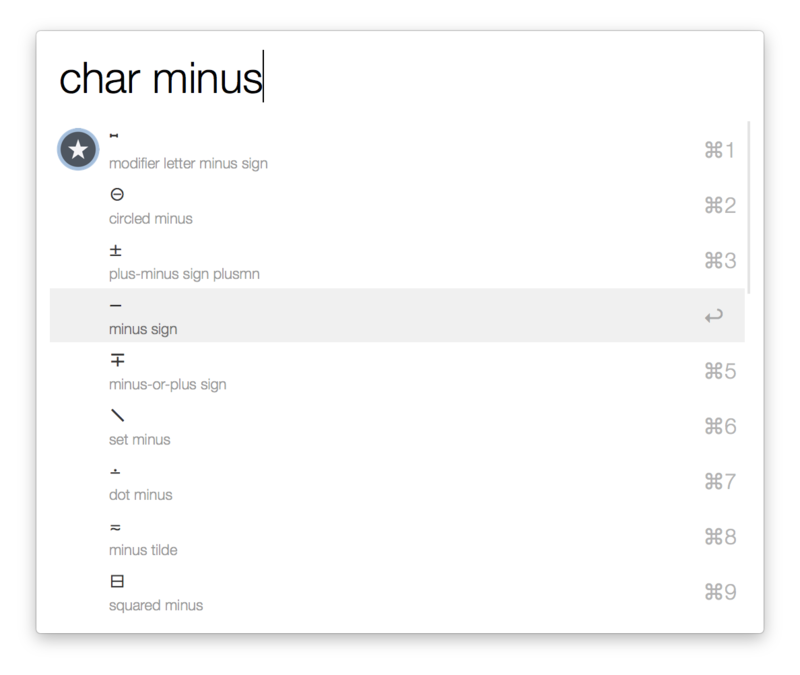 On my Mac, running OS X El Capitan, I can get a minus sign by invoking the special characters table: control+command+space. I use minus signs pretty often, so it's listed there as frequently used. Just click it or press enter if it's already highlighted, and in it goes. If you need to enter several minus signs in a text, you can copy it to the clipboard and then paste it back freely until you need the clipboard for something else. Not the answer you're looking for? Browse other questions tagged keyboard . How to type ` on Mac keyboard? How to write out a NORMAL tilde sign (~) in Mac? How do you type ~ on the iPhone's keyboard? How to type in Mac window? Are there default shortcuts for special hyphens and minus sign?